10 AM, Caravan meets at Liberty State Part in Jersey City NJ motorcade starts on Interstate 70 to I-95 to Washington DC. The entire day will be spent lobbying congress with meetings and deliveries of packets. Two tiers of meetings. May 2nd Evening – Speakers Event and Rally. May 3rd, March from the White House to the Supreme Court – Hear the ordeals of everyone who wants to be heard. 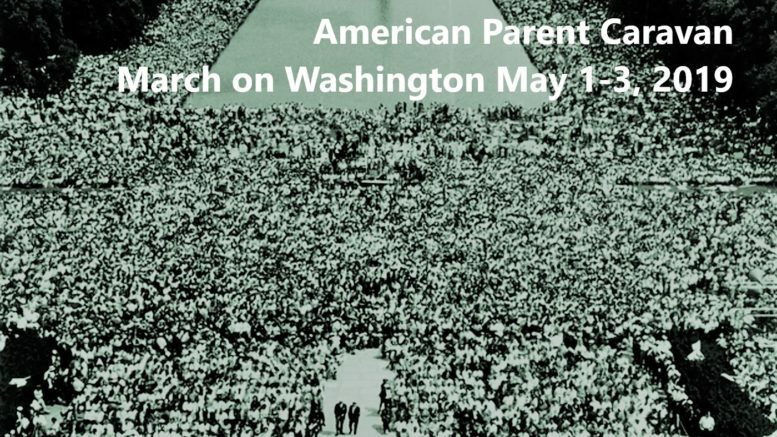 Friday May 3rd Parent March on Washington – Starts at the White House and finishes at the Supreme Court. Should all lawyer disciplinary hearings nationwide be made public? If my Supreme Court case docketed yesterday is heard, hopefully that answer will be yes. Already our high court is taking steps in that direction with its change of practice. In 2015, it made all attorney disciplinary hearings in that court public. Now all filings have been accorded unprecedented transparency under another rule of the Supreme Court put into effect only two months ago. It has mandated that all new filings be converted to electronic format for publication on its website even though paper booklets and pauper petitions are still required. My case was filed on January 9, 2018 and docketed on January 17, 2018. It is among the earliest to come under that rule. Titled Leon R. Koziol v Attorney Grievance Committee for the Third Judicial Department, Case No. 17-993, it offers the complete Petition and Appendix (lower court record) for public viewing. And the best part: no fee. That’s right, it’s free! Competent filings can cost hundreds of thousands of dollars, even millions with the big firms. Filing and submission costs together with highly technical formatting rules can cost the filer a minimum $1,500 just for the 40 copies of Petition and Appendix each (and three per adversary). That cost does not include lawyer fees and record production. In my case, attorney regulations were abused to achieve an illicit purpose. Ethics lawyers eventually discharged for falsifying their time sheets dug up all sorts of trivia and anonymous grievances to discredit my judicial whistleblowing activity. They got away with it because lawyer proceedings are confidential. Now you can read all about my John Grisham ordeal on the Supreme Court website. Just hit the search bar, then the docket search, and type in the case name or number. It’s easy, and you can immediately educate yourself to constitutional law and the inner workings of our court system. It would otherwise cost you thousands of dollars in lawyer research and writing fees. You will note that my earlier filings have no such public offerings. Tomorrow I will present a summary of high profile cases that I won prior to the retributions by the Third Judicial Department. Its purpose is to convince you not only of the quality and merit behind my Supreme Court case, but why you should support it as explained in yesterday’s post. And once again, kindly share this post for the sake of all victims of the carnage which is occurring daily in America’s divorce and family courts. While Abortion Rights are Routine in our Supreme Court, Shared Parenting Rights have never been heard. Now there’s a headline you’ve never seen. But it is shockingly true and a reflection of how insignificant we are as parents in this country. Every year our constitutional right to raise our children is being further eroded without so much as a footnote in the decisions from our high court. For the past ten years I have done everything legal and humanly possible to reverse that trend, to give you human dignity as a loving mom or dad, but sadly, due to an utter lack of funding, I have failed. Meanwhile the right to abort children and market their body parts has been well funded and well received during that same period. Indeed only a few months ago, among the most recent cases heard and decided by the Supreme Court, you will find a pro-abortion case, Whole Woman’s Health v Hellerstedt and Texas, et. al. Case No. 15-274 (June 27, 2016). Meanwhile three of the four parents who announced their filings at the Supreme Court on June 17, 2016 are being considered for the same day. Yours is destined for the same fate. Nevertheless it is too important an issue to surrender. If you’ve been following my petition now being considered by the Supreme Court you know that a Supplemental Brief was recently accepted to provide additional support for such a case, a historic first which I sacrificed everything to achieve. Among other things, due to the severe neglect of this right in recent decades, I have asked for appointment of a Special Master to investigate and report on parent-child abuses in our nation’s divorce and family courts. Yesterday we gave you a summary of cases over the past 100 years since the parenting right was first announced. Today we show you what happens when a judicial whistle blower, civil rights attorney and model parent tries to reform a lucrative divorce industry which is producing damaged children, unprecedented immorality and the kind of crime our society can no longer control. Government simply throws more tax dollars at this epidemic while profiting off our misfortunes. Point One: Based on this Court’s recent decision in McDonnell v United States, the respondent district court committed an egregious abuse of discretion by suppressing challenges to vague, absurd and retaliatory court orders. Petitioner has been exposing court corruption and misconduct for ten years in virtually every state of the union, even Hawaii when President Obama visited. It has reached epidemic proportions with no sign of reform or shared parenting structure mandated by our Constitution. That is because the suppression of speech, press and organizing efforts is so profound in our judicial branch of government that relevant experts and civil rights lawyers such as petitioner are persecuted beyond conscience. In McDonnell v United States, No 15-474 (June 26, 2016), decided after the originating petition here was filed, this Court vacated a conviction of former Virginia Governor Robert McDonnell based on jury instructions and a statute which was found to be overly expansive. The definition of an “official act” for purposes of criminal liability was deemed to have serious constitutional infirmities. At the same time, petitioner is being victimized by …vague and overbroad orders in New York’s domestic courts with undue, unfair and excessive scrutiny by attorney disciplinary agents. Indeed this is by far an unprecedented case. The state has usurped the self-governing rights of a democracy in order to profit off our children. The atrocities over a natural right tracing itself to the beginning of civilization are being perceived as everyday oppression by an increasing variety of terrorists, criminals, protesters and mainstream parents. A remedy is now required to show that our system of American justice works after all, even if petitioner can never be made whole again. The “prohibited alcohol related gesture” finding was never prohibited previously and concocted from a wedding toast. It was conceded at a “mini-hearing” without due notice, ten minute limits for case presentation and no recording for appellate purposes. On such a hearing, petitioner lost his children potentially forever in light of the severe and un-remedied alienation underway over the past three years. Other than pure evil and the violation of a fundamental right, what else can explain the concoction? On the last weekend together in January, 2014, there was happiness, sharing of plans, hugging and promising father-daughter relationships to last a lifetime. But the quest for money and revenge was so prevalent that these girls were brainwashed and made to shut out all trace of their natural father without so much as an allegation of abuse. This evil course of action was pursued not by a natural mother but a creature of statute known as a “custodial parent” trained to war against her counterpart. Dads, moms and children are increasingly viewed as objects instead of dignified human beings under this “opposition framework” for parenting. It was sufficient to cause respondent appellate Judge John Centra to issue a stay order on December 13, 2013 on grounds that the proceedings here were “structurally flawed” with petitioner having no record of abuse. That order facilitated the last weekend petitioner spent with his girls before being vacated by the same Judge Centra and his panel only days after exposure of related misconduct. It occurred on petitioner’s website which has become the target of censorship by all respondents due to a tagging of publications relating to individuals. Petitioner’s global following has become so impacting that these publications can arise on a first page Google search of a judge or lawyer. Sufficiently offensive as it is protected by our Constitution, this has set in motion very alarming reactions. Oppression is otherwise corroborated by such cases as Pearce v Longo, 766 F. Supp.2d 367 (NDNY 2011). A police investigator committed a murder-suicide after exiting support court, a key factor that was ignored, leaving three children without parents and the city with a $2 million liability. Respondents have been exploiting judicial weapons to punish these publications. They have all but stated this in decisions, actions and defamatory orders throughout the record. With an arsenal at their disposal perceived as sacrosanct by an unsuspecting public, they have been able to shut down reform as their public critics emerge in courts throughout the country. Indeed at least two other pro se parent petitions are pending for conference on the same day as this one. Dr. Mario Jimenez and John Batista joined petitioner at a news conference outside this Court to announce our filings only to incur further retributions. Truth itself is ever elusive in these courts because offspring are made the prize or “award” in custody wars. In this case, respondents exploited the patent fabrications of Judge King and the brazen perjuries of William Koslosky and Hawse-Koziol. This is well established in prior filings here and the records below. These frauds remain so pervasive and even encouraged for retribution purposes that almost anything can be conjured up to finish off this public critic. But only the public critic was prosecuted with non-criminal and inflated support obligations based on a highly abused “imputed income” practice. This was in lieu of reliable evidence and a proper distribution of the burdens of proof. The disrespect increasingly directed at parental rights is corroborated by the July 7, 2016 summary order of the Second Circuit. It affirmed Judge Sharpe’s August 10, 2015 decision denying leave to file an appeal pursuant to FRAP Rule 4(a)(5). The frauds and perjuries in family court became so insurmountable that petitioner’s children could have their residence concealed on the family court record for a period of eight months without any accountability. Such callous disregard was clearly retaliatory. Devastation to petitioner when this scheme was discovered on Fathers’ Day 2015 was so severe that it forced him to escape the region and miss a next day filing deadline regarding Judge Sharpe’s May 22, 2015 decision. Such devastation mattered not at all for “good cause” or “excusable neglect” and was sadistically cast aside without so much as a footnote. Judge Sharpe concluded instead that petitioner “had only himself to blame.” A-I at 68. See also Kirtsaeng v John Wiley 15-375 (June 16, 2016) on Sharpe’s abuse of fee sanctions. From left, Dr. Leon Koziol of New York, John Bautista, of Virginia, Dr. Dan Pestana of California and Dr. Mario Jimenez of Florida hold news conference on steps of Supreme Court to announce the filing of petitions to rectify constitutional abuses in family courts. Dr. Leon Koziol announced today the filing of a Supplemental Brief with the Supreme Court in the case of Leon Koziol v United States District Court for the Northern District of New York pending since June 17, 2016. On that day, four parents from different parts of the country held a news conference in Washington D.C. to help persuade the high court to give us meaningful accountability and constitutional protection of our parental rights. The Brief dated September 17, 2016 was submitted this week to alert the court to escalating retributions from the states to our reform efforts. Interestingly three of the four parents who filed their petitions in May, June and July, 2016 are having their cases considered on the same day. The fourth parent received a decision this month in his federal case allowing him to go forward on certain of his claims in the California system, a rare event. Significant to all victimized moms and dads, the Supplemental Brief asks the Supreme Court to order appointment of a Special Master to hold hearings and investigate Title IV-D funding of our state courts, erosion of parental rights and its adverse impacts on our children. It is part of a mandamus and prohibition action which Dr. Koziol filed in a federal appeals court in Manhattan against judges of the Northern District of New York due to a half century of undue deference to our nation’s divorce and family courts. FOR YOUR SAKE AND THAT OF OUR FAMILIES, HELP US MAKE THIS POST VIRAL: If you have a judge or lawyer engaged in the kind of conduct challenged here, your community and judicial accountability agencies should know about it. If you need help in this regard, check out the range of services we offer here at www.parentingrightsinstitute.com. Will Donald Trump File a Brief on Supreme Court Case No. 15-1519 Re: First Amendment and Justice Ginsburg? Weeks ago you and I discussed the motion filed on my pending case before the Supreme Court regarding a disqualification of Justice Ruth Bader Ginsburg. That motion was accepted as a “Suggestion for Recusal” on August 9, 2016 under Case No. 15-1519; Leon R. Koziol v United States District Court for the Northern District of New York. It will be decided on or after September 26, 2016. That gives Donald Trump exactly two weeks to submit a formal position directly to our nation’s high court in the way of an amicus brief, even if limited only to his campaign issues. Because Justice Ginsburg opened the Trump campaign to public criticism, it is only fair that Mr. Trump seize the opportunity which I have uniquely provided for him. This is truly an extraordinary case. With professional football players exercising their First Amendment rights on 9-11 without retribution, my case features a civil rights attorney punished for his accurate criticisms of our Third Branch of Government. My mandamus action is directed to a federal judge removed from a case because of a human gene he used to decide cases which the scientific community will purportedly not discover for 50 years (Northern District Judge Gary Sharpe in United States v Cossey, 632 F.3d 82). I am once again sending you a copy of my motion. Please contact me at your earliest convenience at (315) 796-4000.